Summary. Regulation of adhesion receptors (AR) expression on endothelial cells (EC) is controlled by tumor necrosis factor (TNF), a pleiotropic cytokine, being a local mediator of cellular homeostasis and immune response. TNF is one of the first cytokines that are secreted in inflammation and lymphoid tumors (LT). The increase in TNF-α expression promotes tumour metastasis and induces the endothelial dysfunction in many pathophysiological conditions. Aim of study was to determine an adhesive ability of human fetal umbilical vein endothelial cells (НUVECs) to adhere to cells of leukemic lines К562 and L1210 after treatment with various concentrations of recombinant human TNF (rhTNF), (Sigma, USA). Materials and Methods: HUVECs were obtained as described Jaffe E.A. et al., 1973. Cell suspension of К562 or L1210 were labeled with 3H-thymidine but not activated with rhTNF before experiment and were added to the monolayer of HUVECs. The level of attachment cells was estimated as the index of adhesion (IA). 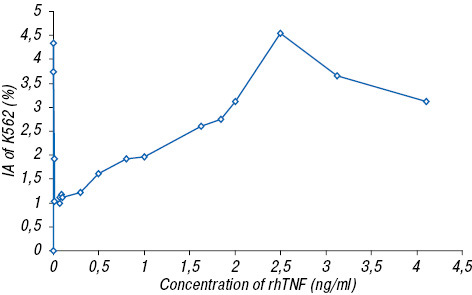 Doses of rhTNF were selected according to the predefined blood level of endogenous TNF in healthy subjects and patients with hematologic diseases and have been divided into low, intermediate, high and stimulating ones (the concentration range of 0.001–6.946 ng/ml). HUVECs that were incubated in a non-rhTNF medium have been used as controls. Results: rhTNF exerted a complex dose-dependent influence on adhesive properties of HUVECs in vitro. Parameters of AI for the К562 and L1210 cells were related to the morphologic type of cell line, which was evidenced by a high statistical correlation. Cells L1210 were characterized by high IA parameters after their treatment with low or stimulating doses of rhTNF. Cells К562 adhered to HUVECs after their treatment with stimulating doses of rhTNF. Conclusion: As proven by the obtained results, the TNF cytokine-activated vascular endothelium plays a pivotal role in the initiation of adhesion, while the influence of autocrine secretion of TNF in the very moment of the formation of intercellular contacts. TNFRII (р75), CD120b — the se­cond type of specific receptors to the TNF. Adhesive ability of vessel endothelial cells (EC) is associated with presence of adhesion receptors (AR), surface protein structures which are exposed in inflammation and bind circulating blood cells with adhesion molecules (AM), complementary structures . The highest expression of AR is concentrated on EC of high postcapillary venules of lymphatic nodes, which are called “target” loci or vessel niches that direct immune cells into areas of inflammation and can become sites of expansion of lymphoid tumors (LT) . Regulation of AR expression on EC is controlled by tumor necrosis factor (TNF). TNF, a pleiotropic cytokine being a local mediator of cellular homeostasis and immune response, is one of the first cytokines that are secreted in inflammation. Leukocytes are the main producers of TNF in human body [3, 4]. In peripheral blood, TNF influences its main target, EC, through exposed specific receptors to the cytokine, TNFRI (p55) — CD120a and TNFRII (р75) — CD120b, respectively [5, 6]. Activation of ligand/receptor complexes of TNF in EC triggers an inflammatory type of response, which is associated with adhesion, migration of immune cells into tissues and an increase of procoagulant properties of EC [4, 7]. Analysis of AR expression was for the first time carried out in a culture of EC derived from human fetal umbilical vein (HUVECs) after treatment with TNF as far back as in the last century . Since then HUVECs have been used in studies on angiogenesis and tumor metastases in vitro. It is shown that treatment of recombinant human TNF (rhTNF) with HUVEC activates more than 20 genes, some of which were for the first time revealed in the culture of HUVECs itself. They were named TNF-induced genes or TNF-responded genes [6, 9]. However, a paracrine effect of the cytokine did not induce an emergence of receptors TNFRI and TNFRII on EC. Regulatory mechanisms of TNFRI and TNFRII expression have not been finally defined, which poses some difficulties in the correction of TNF effects in pathologic conditions . The peak of maximal concentration of AR on HUVECs was determined within 4–6 hours after treatment with TNF, while mRNA expression of those proteins may have lasted up to 4 weeks . Human fibroblast growth factor (rhFGF) and nitric oxide (NO) proved to be antagonists of TNF effect on HUVECs [11, 12]. TNF in physiologic concentrations does not incur any direct damage to EC. However, this factor may in certain pathologic conditions turn to be one of the main mediators of development of vascular pathology and expansion of malignant tumors [4, 7, 12]. As shown in experiments, injection of the cytokine to laboratory animals with engrafted melanoma induced the development of metastases in lungs and brain [4, 5, 13]. Expression of ІCАМ-3, a pathologic receptor, on endothelium of lymphatic nodes was noted in 54% more cases of Hodgkin’s lymphoma than in controls and correlated with the level of TNF in blood [14, 15]. Nevertheless, available reports do not completely elucidate the effect of the cytokine on adhesive behavior of EC. Therefore, our study was based on assumption that TNF, which was previously measured in the blood of patients with LT , can modulate the surface of EC and influence the spre­ading of illness in human body. In our study, we attempted to determine an adhesive ability of НUVECs to adhere to cells of leukemic lines К562 and L1210 after treatment with various concentrations of recombinant human TNF (rhTNF). Our study object has been the HUVECs, obtained from the Laboratory of Immunocytology and Genetics of Blood Tumors at the Research Institute of Blood Pathology and Transfusion Medicine. We have stu­died adhesive properties of those cells after treatment with various concentrations of rhTNF. For the study purposes, we used neoplastic hematopoietic cells of both human erythromyeloid leukemia (К562 line) and acute lymphoid leukemia іn mice (L1210 line) that were labeled with 3H-thymidine but not activated with rhTNF before our experiment. The chosen cell lines show a marked substrate-independent and suspension-mode growth type and do not stick to the gelatin covering the bottom of culture dish during a short period of incubation. Doses of rhTNF were selected according to the pre-defined blood level of endogenous TNF in healthy subjects and patients with oncologic or hematologic diseases and have been divided into low, intermediate, high and stimulating ones (depending on the exerted effect). They are detailed in Table. Method of obtaining a culture of HUVECs. HUVECs were obtained in a sterile environment by means of enzymatic influence of collagenase on the inner surface of umbilical vein wall, as described earlier . Method of evaluating the adhesive properties of HUVECs. After the 3rd passage in the nutrient medium 199 at concentration of 1•106/ml, HUVECs were seeded into collagen-coated wells (100 mcl per each) of a 96-well tray (Nunclon, Denmark) and incubated for 3 hours in the atmosphere of СО2 at 37 °С. A 100 mcl amount of RPMI 1640 containing certain dose of rhTNF (Sigma, USA) was later added to cells. We used this factor within the concentration range of 0,001–6,946 ng/ml. HUVECs that were incubated in a non-rhTNF medium have been used as controls. All studies were carried out in triplets. The filled in tray was incubated for 4 hours in the atmosphere of СО2 at 37 °С. К — mean value for three estimates of the quantity of radioactive decays per minute as measured in the control sample. Statistical analysis. Statistical analysis was conducted using an equation of linear regression (y=a+bx) which showed the dose-effect. Obtained data were estimated by coefficient correlation (r) and independent Student’s t-test with the use of MS Excel programme. The indexes of p ≤ 0.05 and r ≥ 0.3 or r ≥ —0.3 were considered statistically significant. It has been found that rhTNF exerts a complex dose-related influence on the modification of adhesion of HUVECs to the cells of two different lines. The influence of increasing concentrations of the cytokine on the IA of human erythroleukemic cells (К562 line) and cells of lymphoid leukemia in mice (L1210 line) is presented both in the Table and graphically in Fig. 1 and 2. Low concentrations of the cytokine (0.001–0.067 ng/ml) caused the slowing of increased adhesion of K562 cells to EC (Fig. 1). However, those high concentrations of rhTNF (3.240 ± 1.870 ng/ml) were associated with inhibition of the attachment of К562 cells to EC. By analyzing the parameters of adhesion of L1210 cells to the monolayer of HUVECs, we determined that the changes of adhesive properties of these cells under the influence of rhТNF were somewhat different than those of К562 cells, as shown in Fig. 2. 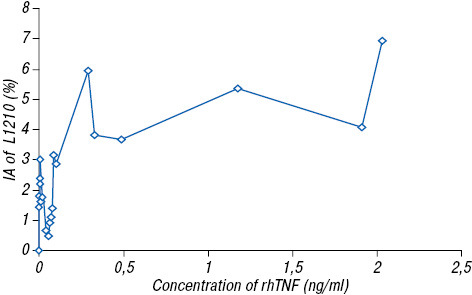 Adding rhTNF at concentration range of 0.024– 0.050 ng/ml induced a gradual and marked slowing of the adhesion of those cells up to its inhibition (IA < 1.0). At a concentration of the cytokine ≥0.060 ng/ml, both a recovery and increase of adhesion of L1210 cells to the monolayer of HUVECs in the entire range of stu­died rhTNF doses was noted. The IA of L1210 cells concomitantly increased from 0.900 (at rhTNF concentration of 0.060 ng/ml) up to 6.946 (at rhTNF concentration of 2.030 ng/ml). As shown in Fig. 3, there is an increased adhesion of the cells of acute leukemia in mice (L1210 cell line) to the monolayer of HUVECs after their treatment with 0.140 ng/ml of rhTNF. A strong direct correlation between the AI parameters of L1210 and the increasing doses of the cytokine within the range of 0.050–2.030 ng/ml (r = 0.784; p = 0.001) has been demonstrated. y — value of IА. The comparative characteristics and differences in the effects of various rhTNF concentrations on adhesive properties of HUVECs to the cells of K562 and L1210 lines are summarized in the Table. As shown above, low concentrations of rhTNF stimulate adhesive properties of HUVECs to the cells of L1210 line thus slowing down the adhesion. Similar doses of rhTNF induce an immediate decrease of the attachment of К562 cells. Subsequent stages of the influence on adhesive properties of HUVECs and respective concentrations of rhTNF are very similar: there are phases of both recovery and acceleration of the adhesion. High concentrations of rhTNF (>2.5 ng/ml) cause an inhibition of adhesion to HUVECs, and such an effect has been observed for the cells of К562 line only. In our work, we investigated the influence of various concentrations of rhTNF on the modification of adhesive properties of HUVECs and determined an IA of the cells of К562 and L1210 lines in vitro. Unlike other publications elucidating the behavior of HUVECs after their treatment with only one fixed dose of rhTNF, the advantage of our study proved to be evaluation of how HUVECs are influenced by a considerably broader range of rhTNF concentrations. It has been determined that cell adhesion after a 4-hour treatment of the monolayer with rhTNF was significantly higher than in controls [9, 10]. The parameters depended both on the dose of cytokine and type of cell lines. The IA value for L1210 cells was significantly higher than that for K562, especially after treatment of HUVECs with low doses of rhTNF. The obtained results are generally consistent with current observations . At the same time, our attention has been attracted by the differences in adhesive behavior of К562 and L1210 cells in the completed experiments, which has to some extent been explained in the publications of other authors [3, 5]. As it turned out, the cell lines, apart of their different morphologic origins, also showed different potentials of TNF secretion [3, 18, 19]. It has been shown that the ability of L1210 to secrete TNF proved to be a pivotal factor in the development of tumor metastases in the brain of mice . A similar dependence has been found in other studies on the cells of ovarian cancer, which exposed a membrane-associated TNF and adhered to HUVECs more quickly than the cells with repressed TNF gene [3, 13]. К562 cells, unlike L1210 cells, are not capable of secreting the TNF. As it turned out, the cytokine genes in these cells are repressed by methyl radicals so they are not expressed even after treatment with bacterial LPS and mitogens . It is quite possible that К562 cells under presence of low doses of rhTNF are not able to independently induce the emergence of АR on HUVECs due to intrinsic deficiency of autocrine TNF. On the other hand, the parameters of adhesion in our experiments may have been influenced by a specificity of the chosen EC model, HUVECs, that are likely expressing the binding loci for intact leukocytes rather than tumorous cells . At the same time, a malignant transformation of cells can determine their adhesive behavior in vivo. This transformation is often associated with both the loss of normal AM to surface endothelial AR and the emergence of new, pathological AM that are complimentary to glycoprotein structures of the proteins of extracellular matrix, which are located within intercellular pores of EC . In neoplasms of LT types, such a molecule proves to be CD44 [14, 22]. The highest values of IA for K562 and L1210 cells have been estimated after treatment of HUVECs with high, stimulating doses of rhTNF (0,067–2,500 ng/ml). Noteworthy, a TNF level within the indicated ranges was frequently found in the blood of patients with LT , which may implicate a role for the cytokine in expansion of LT . Inhibition of cell adhesion was revealed at higher concentrations of rhTNF (2,500 to 4,100 ng/ml), which in opinion of some investigators might be due to a rapid release of proteins from the Weibel — Palade bodies and destruction of the glycocalyx layers, which is specific for EC under the influence of a potent stimulator [7, 12]. In those cases, proteins undergo a proteolytic “desquamation” out of plasmatic membrane with subsequent transformation into a soluble state [6, 7]. This event was indirectly proved by accumulation of soluble receptors of TNF, sTNFRs, and soluble adhesion molecules, sICAM-1, -3, and sVCAM-1 in the blood of patients with LT, and their negative prognostic correlation with the disease course was also established [15, 23]. TNF can trigger a destruction of EC through their attachment to proapoptotic receptor of the cytokine, TNFRI . In such cases, an important role is played by transmembranous TNF, which is exposed in inflammation on the adhered leukocytes and released into the medium along with peroxide radicals that are toxic for EC . A multiple adhesion of leukocytes and altered expression of TNF can cause the development of vascular pathology and ischemia of organs [15, 17, 21, 26]. However, ЕC in the conditions of inflammation can reveal some resistance to the effect of TNF. This resistance has been implicated with activation of TNFRII receptor. This protein, unlike TNFRI itself, is more frequently expressed on ЕC and hemopoietic cells and does not contain proapoptotic domains of cell death [4–6]. Ligand/receptor complexes of TNFRII in the presence of antiapoptotic proteins, TNFAIP3/A20, BCL2A1 and TNFRSF10B/TRAILR2/DR5, conduct the signals directed toward both the survival of EC and regulation of expression of adhesion molecules [6, 9]. A prompt emergence of AR on EC is due to the rapid release of proteins from depots, Weibel — Palade bodies and Golgi apparatus in EC, resulting from intercellular activation of paramembranous sphingosine kinase and its product, sphingosine-1-phosphate (S1P), being the main dose-dependent stimulator of adhesion, by the ligand/receptor complexes of TNF . In our previous publications, we determined a high angiogenic activity of HUVECs at high concentrations of rhTNF (ranging 2,310–13,630 ng/ml) in order to prove the above data. Noteworthy, rhTNF in the mentioned doses exerted a high cytotoxic effect on other cell types. In particular, this factor when dosed at concentrations 0,067–2,50 ng/ml destroyed 50–80% cells of cultured mouse fibroblasts (L929 line) . Therefore, our study has proved a complex dose-dependent influence of rhTNF on adhesive properties of HUVECs in vitro; depending on the type of cell line, rhTNF regulated the adhesion of EC or angiogenesis, which may evidence an important mechanism of autocrine-paracrine control of TNF in these processes. By influencing EC, TNF may prove to be a potential inductor of the development of both vessel pathology and unique mechanisms of tumor expansion [4, 5, 7]. Specifically, tumor-secreted TNF can accumulate and exert a paracrine effect through blood and lymphatic circulation thus pre-modifying the surface of EC to the development of metastases [4, 7, 15, 19]. On the other hand, the adhesion can be regulated locally by the migrating neoplastic cells, which are able to both secrete the TNF by autocrine mechanism and determine the localization on vessel niches in the very moment of the formation of adhesive contacts [3, 18, 19, 20]. In general, the achieved data implicate TNF in being a pivotal therapeutic target in LT expansion and point out to the need of measuring the blood level of this cytokine before and after the completed treatment for the prevention of vascular pathology. In conclusion, rhTNF exerted a complex dose-dependent influence on adhesive properties of HUVECs in vitro. Parameters of AI for the К562 and L1210 cells were related to the morphologic type of cell line, which was evidenced by a high statistical correlation. L1210 cells were characterized by high IA parameters after their treatment with low or stimulating doses of rhTNF. К562 cells adhered to HUVECs after their treatment with stimulating doses of rhTNF. As proven by the obtained results, the TNF cytokine-activated vascular endothelium plays a pivotal role in the initiation of adhesion, while the influence of autocrine secretion of TNF in the very moment of the formation of intercellular contacts. 1. Lorenzon P, Vecile E, Nardon E, et al. Endothelial cell E- and P-selectin and vascular cell adhesion molecule-1 function as signaling receptors. J Cell Biol 1998; 142: 1381–91. 2. Michie SA, Streeter PR, Bolt PA, et al. The human peripheral lymph node vascular addressin an inducible endothelial antigen involved in lymphocyte homing. Am J Pathol 1993; 143: 1688–98. 3. Sullivan KE, Reddy ABM, Dietzmann K, et al. Epigenetic regulation of tumor necrosis factor alpha. Mol Cell Biol 2007; 27: 5147–60. 4. Wu Y, Zhou BP. TNF- α/NF-κB/Snail pathway in cancer cell migration and invasion. Br J Cancer 2010; 102: 639–44. 5. Chandrasekharan UM, Siemionowa M, Unsal M, et al. Tumor necrosis factor-α (TNF-α) receptor-II is required for TNF-α-induced leukocyte-endothelial interaction in vivo. Blood 2007; 109: 1938–44. 6. Su X, Ao L, Zou N, et al. Post-transcriptional regulation of TNF-induced expression of ICAM-1 and IL-8 in human lung microvascular endothelial cells: An obligatory role for the p38 MAPK-MK2 pathway dissociated with HSP27. Biochim Biophys Acta 2008; 17: 1623–31. 7. Fukumura D, Salehi HA, Witwer B, et al. 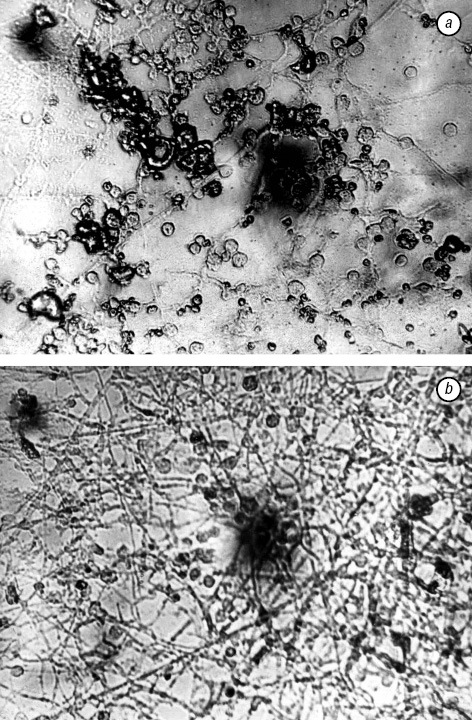 Tumor necrosis factor α-induced leukocyte adhesion in normal and tumor vessels: effect of tumor type, transplantation site, and host strain. Cancer Res 1995; 55: 4824–9. 8. Jaffe EM, Nachman RL, Becker CG, et al. Culture of human endothelial cells derived from umbilical veins. Identification by morhological and immunological criteria. J Clin Invest 1973; 52: 2745–56. 10. Dajana E, Bertocchi F, Bortolami MC, et al. Interleukin-1 promotes tumor adhesison to cultured human endothelial cells. J Clin Invest 1988; 82: 1466–70. 11. Zhang H, Issekutz AC. Down-modulation of monocyte transendothelial migration and endothelial adhesion molecule expression by fibroblast growth factor reversal by the anti-angiogenic agent SU6668. Am J Pathol 2002; 160: 2219–30. 12. Zhang H, Park Y, Wu J, et al. Role of TNF-α in vascular dysfunction. Clin Science 2009; 116: 219–30. 13. Asher AL, Mule JJ, Kasid A, et al. Murine tumor cells transduced with the gene for tumor necrosis factor-α: evidence for paracrine immune effects of tumor necrosis factor against tumors. J Immunol 1991; 146: 3227–34. 14. Drillenburg P, Pals ST. Cell adhesion receptors in lymphoma dissemination. Blood 2000; 95: 1900–10. 15. Lwin T, Crespo LA, Wu A, et al. Lymphoma cell adhesion-induced expression of B cell-activating factor of the TNF family in bone marrow stromal cells protects non-Hodgkin’s B lymphoma cells from apoptosis. Leukemia 2009; 23: 170–7. 16. Matlan VL, Volod’ko NA, Barilka VA, et al. Production of tumor necrosis factor in lymphoproliferative disorders: tumor-host interaction. Oncology 2000; 2: 167–71 (In Ukrainian). 17. Bin L, Vincent A, Cates J, et al. Low levels of tumor necrosis factor-α increase tumor growth by inducing an endothelial phenotype of monocytes recruited to the tumor site. Cancer Res 2009; 69: 338–48. 18. Akers SM, O’Leary HA, Minnear FL, et al. VE-cadherin and PECAM-1 enhance ALL migration across brain microvascular endothelial cell monolayers. Exp Hematol 2010; 38: 733–43. 19. Brandsma D, Ulfman L, Reijneveld JC, et al. Constitutive integrin activation on tumor cells contributes to progression of leptomeningeal metastases. J Neurooncol 2006; 4: 127–36. 20. Kagami Y, Sivasundaram K, Nakagawa A, et al. Establishment of an adult T-cell leukemia cell line (HU-ATTAK) dependent for proliferation on human umbilical cord vein endothelial cells. Leukemia 2013; 5: 11–8. 21. Ando T, Langley RR, Wang Yu, et al. Inflammatory cytokines induce MAdCAM-1 in murine hepatic endothelial cells and mediate alpha-4 beta-7 integrin dependent lymphocyte endothelial adhesion in vitro. J Physiology 2007; 7: 10–7. 22. Fedorchenko O, Stiefelhagen M, Peer-Zada AA, et al. CD44 expression in CLL is micromilieu instructed and promotes leukemic cell survival, which can be antagonized by CD44 antibodies. Blood 2013; 121: 4126–36. 23. Banks’ RE, Gearing AJH, Hemingway IK, et al. Circulating intercellular adhesion molecule-1 (ICAM-1), E-selectin and vascular cell adhesion molecule-1 (VCAM-1) in human malignancies. Br J Cancer 1993; 68: 122–4. 24. Vanlangenakker N, Bertrand MJM, Bogaert P, et al. TNF-induced necroptosis in L929 cells is tightly regulated by multiple TNFR1 complex I and II members. [Electronic resource] Cell Death and Disease: http://www.nature.com/cddis 2011; 2: e230. 25. Horiuchi T, Mitoma H, Harashima S-І, et al. Transmembrane TNF-a: structure, function and interaction with anti-TNF agents. Rheumatology 2010; 49: 1215–28. 26. Hebert M-J, Gullans SR, Mackenzie HS, et al. Apoptosis of endothelial cells is associated with paracrine induction of adhesion molecules evidence for an іnterleukin-1 (3-dependent paracrine loop). Am J Pathol 1998; 152: 523–32.